Some little girls want to dress as princesses all day. They want the tiaras, and the fancy dresses, and the clackety heals. Some want to be cops just like their dads. They chase the dog around, trying to arrest the “bad guy”. And some little girls just want to be as color full as they can. Your little girl is the kind that loves everything colorful. The kind that tries to wear every color of the rainbow every day. Blue leggings with a yellow and blue polka dot skirt. She even threw a purple feather boa. She truly did look like a walking, talking rainbow. But all that didn’t prepare you for her excitement when you took her to the circus for the first time, and she saw the colorful, goofy clowns. She demanded that day, and every day after that, to be dressed like the energetic clowns that came pouring out to the main stage. This Child Big Top Fun Clown Costume is just the thing she would choose to wear herself. It has all of the colors she demands in her daily outfits. 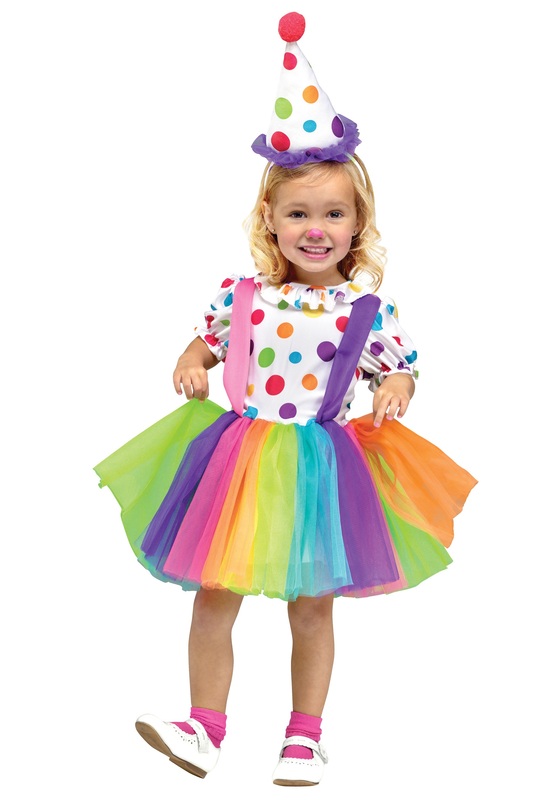 She will get to dance around, twirling her vibrant skirt. She really will be as colorful as a rainbow. And this way, you won’t have to wash all of her clothes every few days because she decided to put the all on at the same time. No, this is a skirt, shirt, and hat combo, making it easy for her to have the color but not for you to have the laundry!